This entry was posted in retirement and tagged 7million7years, CD, Investing, property, real estate, retirement, Saving by Adrian. Bookmark the permalink. Yep…stocks, real estate and (possibly) a few other things that do not have fixed returns, guarantees or unjustifiable high fees to eat into your returns. Most of the time, my own “number” will be divided between real estate and equities. Some cash/short term debt securities or equivalent to ensure that I never need to sell things when prices are depressed but that’s it. Sure, stocks go up and down. Historically they have beaten inflation by a comfortable margin over the longer term. That’s not a guarantee of course which is just fine because no sensible person would want a guaranteed investment (other than a small amount of cash/near cash investments for short term needs). I could write a whole post on why I would not want to rely on owning/running a private business once I am in “retirement”. owning and running your own business when your in retirement? hmm doesn’t sound like retirement to me. I think that might be a great vehicle for obtaining your number/date,but once there, maybe switch up to something that gives you more free time. 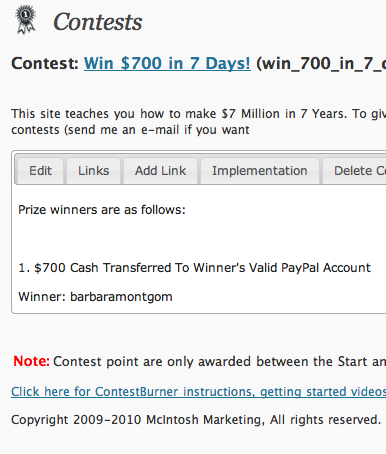 well, I want to wish everyone who entered and promoted the site good luck in the contest. contests are always lots of fun. Adrian, thanks for the gift certificate, and your welcome. I saw the note included with the gift ,thanking me for working hard on the contest. But when your involved with something that is fun,it really doesn’t feel like work,and there were a host of others that did a fine job as well. I also made some interesting finds out there that I’d like to revisit in the near future.Trisha,Congrats on the gift certificate.Barbara,congrats on your win, and thank you to everyone who helped promote Adrian’s contest. I hope you all had as much fun as I did. I just want to say thank you! WOW I am still in schock that I won the contest…. it was a great Thanksgiving Day Surprise. Congrats to both Steve and Trisha who wom gift certificates as well. … and, that’s a wrap 🙂 Thanks to everybody who participated! Sure, hold a contest while I’m out globetrotting (both for work and pleasure). For some reason, I wasn’t able to login to comment on his post, so let me say here that I agree that a business isn’t a great post-retirement choice.